Back here in our country matrimony is considered to be the holiest and most celebrated events in any persons life. It is a holy union where you enter to the next stage of your mortal life. 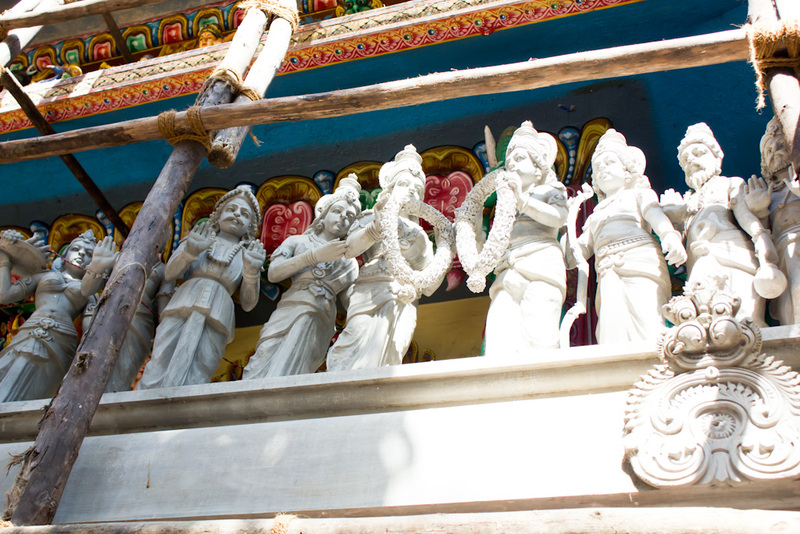 I shot this scene at a local south Indian temple that is undergoing structural renovations. The gopura, like I mentioned about once before, is supposed to be as holy as the deity inside the temple. The new addition to the gopura of this temple depicts a traditional South Indian Hindu marriage, between god, instead of humans. I wonder how grand the celebrations would be up in the heavens! I loved your post too Nandini! Thanks for stopping by! For us marriage is very very holy and if you sit through each tradition, it such adds to the sacredness of the union!